As most of us are dreading the upcoming “three-day” chag, we here at Newsy Jewsy came up with a few tips to help you survive it – and actually make it through feeling great! Memorize all your status updates as they occur, so you can post them immediately after Yom Tov. (You know, at the pizza shop.) The best way to memorize them is to recite each 100 times as you walk to and from shul. The correct response to “Good Yutif/Good Shabbos” is simply a smile. Always walk around with a sefer. If you’re single, your shidduch chances go up exponentially. If not, at least you’ll have an excuse to duck when Aunt Shelly starts yapping about this or that. The moment Hallel goes over 2.38 minutes, just slap your forehead with your palm, and run out of shul like you forgot something. If you want to come back in, just bring that handy sefer. Works every time. Bring ear plugs to shul in case the rabbi’s drasha is too loud. At the start of mussaf, remember to bang on the nearest hard surface so everyone knows you remembered it was Yom Tov. Remember the halacha – If there is no cholent at Kiddush, skip it, there’s plenty of food at home. If there is cholent, but no MEAT in it, skip it. If there is no cholent, but there is potato kugel, some say skip it, others are meikil and permit it. Forget the shower. When things get tough, make this yeshiva-style ready-mix in just five minutes: Stir 2 parts deodorant, 2 parts air freshener, and 1 part Shout. Spray ready-mix on clothes, toilets, or the person’s seat next to you as necessary. It’s all good. Always nap like it’s Shabbos. Even if it’s Thursday. Bolt out before havdallah and find the nearest pizza shop. 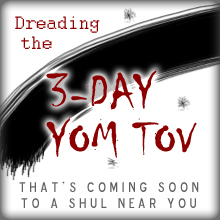 Give us your status updates: Did you survive your Three-Day Yom Tov?? Special thanks to Marissa for this post idea. Islamic State: Gorgeous. Refreshing. To die for. Copyright © 2011 Newsy Jewsy. All Rights Reserved.